President Trump's proposed budget eliminates crucial funding for the Gulf Coast—including the Gulf of Mexico Security Act (GOMESA), which provides funding for coastal restoration, storm risk reduction, and coastal infrastructure projects; and the Army Corps' Louisiana Coastal Area restoration effort, which aims to slow the current trend of coast-wide wetland loss and protect communities. 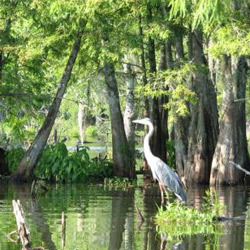 These cuts hurt people, wildlife, and economies across the Gulf Coast region. But the President doesn't decide the final budget—Congress does. And right now, your members of Congress need to hear from you. Take action today, and make sure your elected officials know that Gulf Coast restoration should be a top priority—and fight to protect its funding. I am asking you to defend the Gulf Coast against the devastating cuts in the president's recent federal budget proposal. I ask that you defend the Gulf of Mexico Energy Security Act (GOMESA) by ensuring that the revenue promised to Louisiana goes to Louisiana, where it belongs. I also ask that you support continued funding for other important coastal restoration programs, including the Army Corps' Louisiana Coastal Area restoration program, which did not receive funding in the FY 2018 budget proposal. Ensuring that Louisiana has the resources to deal with its land loss problem protects the Gulf Coast states as a whole. And as a representative of this great state, you know too well how important our coast is to the economic well-being of the entire nation. As another hurricane season begins, we are well aware of how important a healthy, strong coast is as a buffer against these devastating storms. Please be vocal in defending GOMESA and oppose any budget cuts that would be devastating to the people, wildlife and jobs of our Gulf Coast states. Thank you for your consideration and support.